I’ve written about how to potty train your puppy before, but I haven’t spent adequate time addressing the issues many of us face during the process. I’ve gotten a lot of questions regarding house training, many asking how to handle certain setbacks, and today I’m going to address them. Here’s 5 common house training issues & how to fix them. Does your dog keep going to the bathroom in the same spot? Chances are your dog is picking up on those leftover urine smells, even if you think you’ve cleaned the area well. It’s estimated that a dog’s sense of smell is at least 10,000 times better than ours, and they can pick up on leftover smells that we don’t even notice. Dogs have a tendency to prefer going to the bathroom in the same spot, and if there’s any urine scent left in your home they’re going to be attracted to that spot. So if you’re in the middle of house training those leftover smells indoors can override your dog’s desire to go to the bathroom outside. If your dog smells urine in any particular spot inside they might not think twice before using that spot again. For dogs it’s completely normal to keep going in the same area over & over again. To avoid that setback you need to clean up any accidents your dog thoroughly. It’s imperative that you get rid of any smells in that area that your dog may be picking up on. 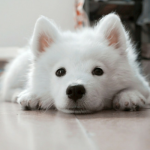 To get rid of urine smell in your carpet use an enzymatic cleaner made for cleaning up pet stains. The enzymes in those cleaners bond to specific molecules and break them down, making it easier to clean up messes and remove stains. The enzymes in pet specific cleaners break up chains of molecules that create the unpleasant odors found in pet urine. You can find enzymatic cleaners from amazon and most pet supply stores. Generally speaking a pup can only hold their bladder for about one hour per every month of age. Your 3 month old puppy might only be able to hold their bladder for 3 hours, and that’s an issue for those of us who work full time. It’s not realistic to expect a 3 or 4 month old puppy to hold it for 8+ hours while you go to work. Have a friend, family member or neighbor take your dog out during the day. Come home during your lunch break to take your dog out (if you work close to home). Hire a dog sitter or dog walker to take your dog out while you’re at work. You can take your dog to doggie daycare (can be cost prohibitive). Crate training is often brought up as a way to prevent your dog from having an accident while you’re at work. While I do think crate training has many benefits such as keeping your dog safe while you’re away I do want to emphasize that it’s not a fool proof method in terms of preventing accidents. It’s true that most dogs don’t want to soil in their crate if given the choice — but remember that most puppies can’t hold it for 8 hours straight, regardless of whether they’re in a crate or not. I’m not suggesting that crate training is bad, I’m just emphasizing that it’s not the miracle tool for house training that some make it out to be. Dogs may be less likely to soil in their crate than they would if they have free roam of the house, but that only works for as long as they’re physically able to hold it in. How many times has this happened to you? You take your dog out to go potty, only to see that they’re interested in everything but going to the bathroom. You’re certainly not alone, this happens to all of us. One of the most common house training issues is dealing with a dog that won’t go to the bathroom when they’re outside. It’s the reason why the meme below is so popular — it’s something we can all relate to. If you take your dog out and they’re not going potty it could be for a number of reasons. Some dogs ask to go out because they want to play, some dogs want to go out and explore, and sometimes it’s because we simply take them out when they don’t have to go. 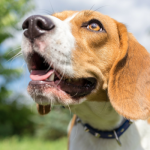 As dogs get older their bladders grow and they can hold it longer, so as you progress along in your house training you’ll notice that your dog doesn’t have to go potty every hour or two like they used to. If you take your dog out every two hours and notice that they aren’t going potty each time chances are they don’t need to go out that often anymore. Instead of taking them out every 2 hours try 3. If your dog asks to go out and they don’t go potty within 5 minutes or so chances are they wanted to go out for something other than a bathroom break. Perhaps they want to play, or maybe they want to go out and track that interesting smell they noticed earlier. I’m not usually one for denying play and exploration, but if you’re still in the middle of house training I’d suggest taking them back inside if they’re not going to go potty, rather than indulging them. I’m not a complete grinch, and I’m not encouraging you to be one either. If your dog is asking to go outside and they only seem interested in play what I suggest is taking them back inside and playing indoors. As they get older and get closer to being completely house broken that rule can change. But for the first month or so of potty training I suggest trying to make the outdoors all about potty breaks as much as possible. Try to avoid turning “do you gotta go outside” into more than just potty time. If you do want to play with your pup outdoors do so when you choose to go out with them, rather than when they ask to go out. One of the biggest misconceptions about potty training a puppy is that they’ll quickly figure out how to let you know when they have to go. Unfortunately not all dogs pick up a cue like scratching on the door right away when they need to go out. 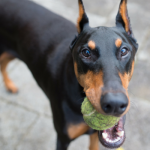 One of the most common house training issues is finding a reliable way for your dog to let you know that they’ve got to go out. If you feel like your puppy isn’t letting you know when they have to go out you’re not alone. A lot of dogs circle and sniff around when they need to go out, but those subtle cues aren’t always picked up on by us. To avoid missing those signs your dog uses when they need to go out you can work on teaching them to use a specific cue. 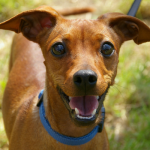 Teaching your dog to use a specific cue when they need to go out such as barking at the door or using a bell will ensure that your dog has a way to reliably get your attention when they need to go outside. Choose which method you’d like your dog to use when letting you know that they have to go out and stick with it. Stand by your dog and encourage them to use that signal before you go outside with them, and praise them like crazy when they use it. With enough repetition your dog will start to associate that signal with going outside, and after enough practice they’ll start using it on their own to let you know when they’ve got to go. If your older dog has suddenly started going to the bathroom inside your house it may be urine marking, or it may be the sign of an underlying medical issue. Urine marking, sometimes called marking their territory, occurs when your dog purposely marks certain areas with his urine. Our dogs commonly mark things while we’re out on walks (peeing in certain areas), but this behavior can also happen at home. Some dogs may mark new items in the house (a new piece of furniture), and some dogs may start marking when a new animal is introduced into the home. Has there been a big change in the house lately? Is there a new animal or baby at home? Is your dog on a new schedule? Did you move to a new house? Is your dog being left alone for longer than usual? All of these changes can cause stress, leading to indoor urination. The good news is older dogs usually respond well to a quick refresher course on potty training. Don’t punish your dog for accidents. Clean up any area that they’ve soiled well, and get back into the habit of praising them for going potty outdoors for a little while. If your dog is repeatedly urinating on a certain piece of furniture you can block that area off with a baby gate. 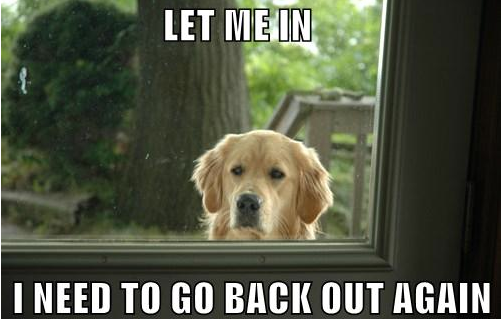 Does your dog seem anxious when you leave for work and have they started peeing inside the house? If so start working on steps to decrease separation anxiety. If your house broken dog has suddenly started going to the bathroom inside your home consult your veterinarian. Great tips! We’re out of the potty training stage now (I hope! ), but when we were training our puppy, it was rough (or should I say ruff;)). She just kept going in the same spot in the corner, and no matter how much we cleaned it she always came back. It was actually our friend who taught us that dogs can smell way better than us and like to go in the same place, and recommended a carpet cleaner to take care of the problem. That definitely helped! The other biggest thing was making sure one of us was always home with her to let her out the first couple of months. I work from home so it was’t too hard, but it did make me think twice about how long I take while shopping, etc. Luckily now she’s fully potty trained and can hold it for several hours so it’s not a big deal. I still feel guilty leaving her cute face alone for too long though! Thanks for these tips! We currently have no problems with our dogs urinating inside the house, but with a big change coming soon (human baby), we’ll have to keep vigilant to ensure the pups don’t get any jealousy issues! Your post answered my question how to take care my older dog when he urinates inside the house. We’ve just bought a 12 week old puppy. It’s early days – day 4 in fact – but she’s still very unreliable when it comes to peeing indoors. We’re doing what we should; taking her out and praising her etc, but sometimes we take her outvfor a loo break and she’ll simply come in to per. Very inconsistent. Is it just a matter of perseverance? Great tips but I’m really struggling to house train my puppy. He’s 13 weeks old and we have had him since he was 8 weeks. He’s started to go outside more now and we thought we were getting there but the last week or so he’s been going inside and not in the same place either. He likes to go outside and then come into to do his business, sometimes on carpet and other times on the laminate flooring. Does anyone have any tips? We ar having the same issues with our puppy. Last week she was doing good and using the same spot outside but this week we have had a huge setback and she would o her business only inside and all over the place. Have you gotten any answers yet? It is becoming a little stressful. Thanks! I have a 3 1/2 months poms girl. Sometimes she uses pad anx sometimes she she uses floor by pad or furniture. What can I do? These are good tips, however I am feeling a little hopeless with my puppy at the moment. She is a 5 month old Havapoo. We got her almost 2 months ago and we are still having problems! I thought for sure she would be easy to train because she could learn not only from from us, but also from our 2 year old Lhasa Apso. We take her out regularly, usually once per hour or hour and a half. We take her out on a leash, she gets praise and a training treat when she potties outside, and she seems to get the concept. These days, she will go potty much sooner outside but just when I think she’s got it, she has accidents. She had not had any accidents for about 3 weeks and now in the last 12 hours, she has pooped on the floor twice. Not in the same spot, just wherever she happens to be. She does not understand to let us know when she needs out; she just goes. I will say that both times she had the accidents, she and our other dog were in the middle of running and playing, so I don’t know if she gets too excited and just goes? She rarely has peeing accidents. Any advice you could give would be appreciated; I’m feeling a little lost! If it’s happening in the middle of play I think you’re onto something with the excitement thing. When I’m playing frisbee or anything physically intense with my dog she’ll often stop immediately and poop. There’s no real warning to it, and she doesn’t do her usual sniff around first routine. If it happens inside she’ll start whining loudly, though I will admit it took me a while to catch onto the “this is my whining because I have to go right now” alert. Exercise speeds up digestion, and when your heart and breathing rate increases so do the contractions in your intestines. 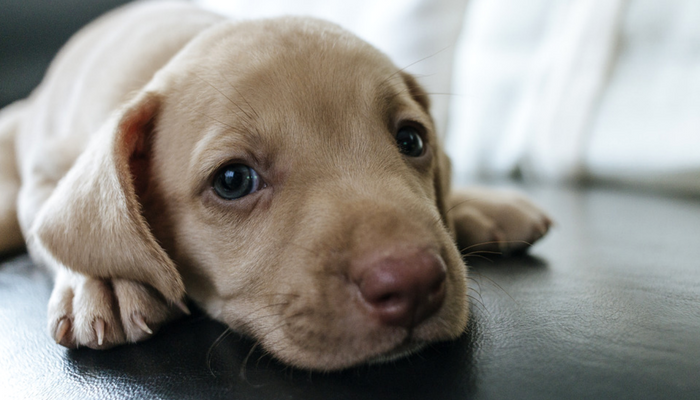 The “need to go right now” urge is hard enough to resist in adults (such as runners), I imagine it’s probably near impossible for puppies to hold it. I’m having a problem with my 3 month old boxer pooping in his crate when we leave the house and getting it everywhere. Even if we leave for a short time. Could he have separation anxiety? We adopted a Aussie mix. She is approximately 8 months old. She is very unreliable in the potty training area. When we think we have it mastered, she goes in the house. Last night I sat outside with her for about 20 minutes trying to get her to go potty. She will not go when leashed! So I have to let her be free. About 2 am, after being woke up by our older dog scratching on the door to go and her coming back in, Mandy (the puppy) pood and peed in the house! She tends to get derailed when it is wet outside and we have had many rainy days in the last week. We have a doggie door that she knows how to use and does go outside (I see her on the cameras), but come home to a dog bed being peed on. My other two dogs, while princesses when it rains, will go outside eventually. Beyond frustrated right now. This!!! My 14wk old puppy is exactly the same…Has been using pee pads (we have no dog door ) and reliably going outside. In the past week (since the heavy rain) he has started peeing & popping inside wherever he wants. He totally ignores pee pad & has started to do little ‘fear wee’s’ when we catch him mid pee and go to put him outside etc. He’s always done little ‘excitement wee’s’ when people get home or greet him & was successfully controlling that when we stopped making a deal and greeting him. Kept if low key and he was ceasing the behaviour…now…that has also regressed. Mopping the whole floor at least twice daily because he often steps in it too. He’s also started peeing on the couch! All since the rain when he stopped peeing outside. Doing my head in!